1. Brands will stop creating email campaigns because machine learning and automation will completely redefine what a “campaign” is. Marketers have long sought to send relevant emails by sending the right content to the right person at the right time. The good news is that technology will enable that on a scale not previously possible. The bad news is that new scale is far too vast and complex for people to manage. “As the number of behaviors captured increases, using the fixed message flowchart-type approach to creating automation sequences that is common to all current automation vendors leads to unmanageable automation,” says Tim Watson, Founder of UK-based email marketing consultancy Zettasphere. The solution? Handing over many more decisions to machines, and moving to “principle-based automation rather than the current prescriptive-based methods,” says Watson. 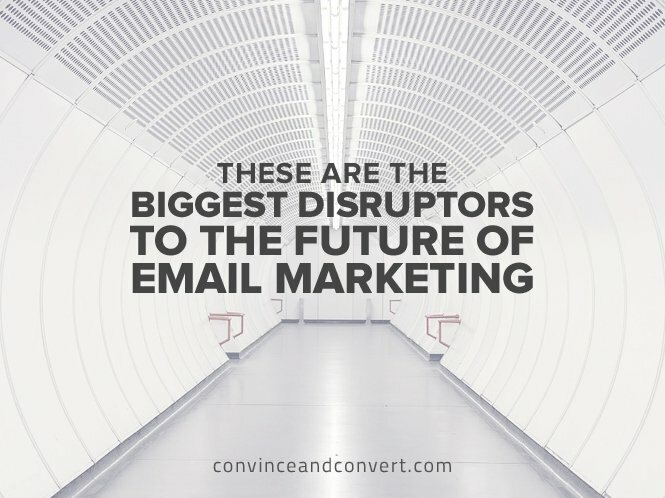 However, as the result of this shift, marketers will cease designing email campaigns as we currently think of them. Organizations able to shift to this abstract level of marketing will pull away from the pack, while those caught in the status quo will struggle to stay relevant in the marketplace. 2. Subscribers will be able to opt out of tracking. Marketers are investing heavily in technology and processes that set them up to deliver on the power of hyper-personalized 1-to-1 email messages. They are breaking down the silos between marketing channels, building a single view of the customer, and mining an increasingly deep pool of Big Data. However, what if privacy laws or technology providers give subscribers the ability to mask a lot of those context clues? What if subscribers have the ability to mask simple inbox behaviors such as opens and clicks? This will put the onus on marketers to explain and demonstrate to subscribers why sharing data back to brands will result in better subscribers experiences. 3. Marketers will have to cater to an entirely new audience: machines. Email volume is going to go through the roof over the next several years. Thankfully, a good chunk of that volume will never be seen by human eyes. Instead, the recipients of those emails will be machines that we want to keep in the loop, says Paul Farnell, Chief Executive Officer & Co-founder of email creation, testing, and analytics software provider Litmus. 4. Email messages will morph into push notifications. Mobile email clients now dominate the list of top platforms for reading emails, with 55% of emails opened on mobile devices during March, according to Litmus Email Client Market Share data. This multi-year shift from emails primarily being read on laptops and huge monitors to being read on 4–6 inch screens has had a profound effect on email design. Email copy has gotten much shorter, and many emails have reduced their focus down to a single call-to-action. Now imagine what will happen to emails as they make the jump from smartphones down to wearables like the Apple Watch, to Internet of Things–devices like cars and smart fridges, and to voice-interface devices like the Amazon Echo. That’s right: Short emails will get even shorter. 5. Email messages will morph into mailable microsites. At this point you might be saying to yourself, “Hey, which is it? Are emails turning into push notifications or microsites?” The answer is both. That’s right—the functionality of inboxes is being pulled in two directions. At one end of the spectrum, there’s the Apple Watch, which can’t display images or support links, since the Watch doesn’t have a web browser. And at the other end of the spectrum is Apple Mail and other WebKit-powered inboxes, which support HTML5 video and other code that allow marketers to create hamburger menus, carousels, and more. Soon the most sophisticated inboxes will enable the holy grail of interactions: “Subscribers will be able to make purchases right inside a marketing campaign, without ever leaving their inboxes. Campaigns will offer more of an app-like experience, too, with embedded video and other interactivity,” says Tom Klein, Vice President of Marketing at email service provider MailChimp. Following in the footsteps of social networks like LinkedIn and Twitter, email will try to make the transition from gateway to destination. The prize will be worth the pain this transition will cause email marketers in terms of added development costs. “Early analytics have shown far greater engagement from users who receive interactive messages,” says Mark Robbins, Email Developer at Rebelmail, which has been a pioneer of interactive email experiences. Email marketers will simultaneously cater to these high-sophistication and low-sophistication inboxes using the same tools they use today: multipart MIME and responsive design. For instance, the plain text version of a multipart MIME format email is served up when the inbox can’t handle the HTML version. This key way of serving up appropriate experience to both high- and low-sophistication inboxes will likely become even more targeted and indispensable going forward. The fact that the Apple Watch supports a new MIME part, watch-html, is an early sign of the growing role that multipart MIME will serve. The Apple Watch reads the watch-html part preferably over the plain text version, allowing marketers to optimize messages for the Apple Watch’s limited functionality. Watch-html may become the standard for similar devices, and we may see the creation of an audio-html part that caters to voice-interface devices. The email marketing channel is firmly ensconced in our daily lives and will continue to generate outsized returns for brands. As it continues to evolve in the years ahead, it will require marketers to stay flexible and be open to experimentation. Get ready for some rollercoaster changes!